Dr. Light has been kidnapped! The only thing found at the scene of the crime was an orange scarf. 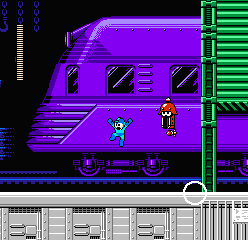 Has Proto Man turned to the dark side for good…? You bet it’s someone else behind this! The fifth installment on the old NES arrived with no surprises. If anything, the big question at the time of its release was why it was on the old 8-bit Nintendo when the SNES had landed in all regions of the world. Even if someone actually would buy into Proto Man being a bad guy in the game (as Ruby-Spears obviously did for the American cartoon), the game itself follows the exact structure set by the last in the series, complete with two fortresses to wade through after the real culprit reveals himself. Three guesses on who it is? Capcom decided to focus more on tweaks and pruning under the hood. 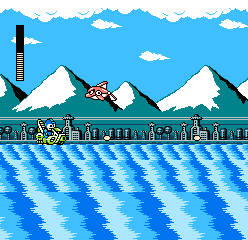 Gone is Rush Marine, practically for good for the rest of the franchise, though a generic jet ski is used for an auto scrolling section of one water stage. The New Mega Buster from Mega Man 4 was plot-wise upgraded to a Super Mega Buster thanks to Dr. Cossack, a modification to address concerns with its overpowered nature. 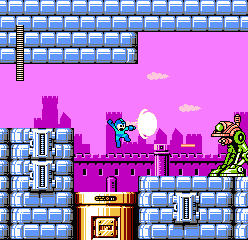 Mega Man no longer flashes green when charging, but instead he flickers black and blue before delivering a newly drawn shot that’s a little wider vertically and shorter horizontally. 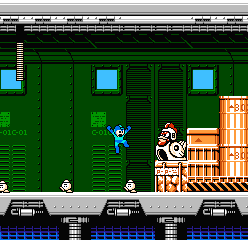 The fully charged shot comes with 2 caveats: its power causes a recoil kickback that, while small, could potentially push Mega Man off a thin ledge. 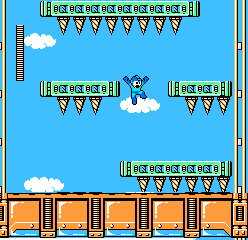 Furthermore, the charge now resets if the Blue Bomber takes damage, adding risk in order to weigh into the limitless powered blasts for better balance with the garnered boss weapons. At least that was the plan. Proto Man’s bad bot posse keeps about the same ratio of great and terrible designs picked from the best or most unique of the contest’s lot, but damn if they don’t shack up in some of the best lairs the series has had. Did anyone really think it was Proto Man all along? Nope, just a tetra of bots built by Wily that fooled the good doctor and his gullible blue robo-boy. 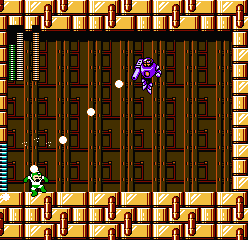 They serve as the bosses for Proto Man’s Castle and have many colored and variants: Green Tank Treaded DM 1, Grey Electro Barrier DM 2, the super-cheap Purple Freeze Sniper DM 3, and the Spiked Red Combination Leader DM 4. They’re pretty alright baddies but not as threatening as many of the screen-filling bosses the Fortresses are known for. 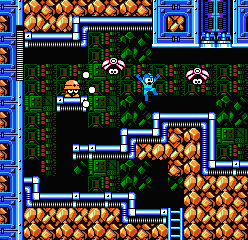 Wily saved those for later. Two faults with the enemy designs hinder the game in different respects. The first is the influx of multiple air or aerial bots, most of them having the AI complexity of a DOOM zombie: beeline toward the player. Granted, each of these foes do so in a manner unique enough to distinct them on that act alone, but the added annoyance of so many divebombing metallic kamikazes seems less a fun challenge and more an excuse to break out the Gravity Hold. Second flaw: a more aesthetic setback, but many of the enemies lack a charming animalistic or humanoid look – or the trademark googly eyes, in some cases. Many of the robot forces look like, well, robots: lifeless gun turrets, flying drones, dull factory machines and missiles. Granted, there are still robotic dolphins, radio-controlled mice, and hens pumping out marching eggs, and the standard Joes and Mets arrive in new forms, but the stacks of bland uninteresting non-fauna to shoot do take some of the possible fun out. The special weapons take a dramatic drop in quality. Various factors like glitching or unbalanced energy consumption or just plain lack of enemies with a weaknes to any of them makes sticking to the stock buster a wiser choice. The Water Wave works as a faster Bubble Lead but tends to not propel itself if you stand near a ledge. Star Crash shields disperse after one single contact, even from a stray enemy bullet, yet doesn’t destroy many threats with one hit in return. 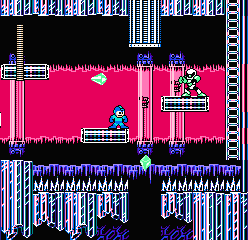 The Crystal Eye would be better suited with an eight-directional attack method and/or more baddies that are actually weak to it – plus you have to wait for all the scattering balls to disappear before you can launch another volley. The Charge Kick only works during sliding, whether you want to use its energy or not, and doesn’t prevent you from taking a hit most of the time. 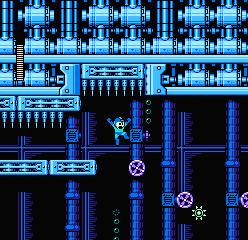 The worst offender is the Power Stone weapon that spins outward from Mega Man in a dazzlingly fast trajectory you cannot aim with barely anyone but Charge Man weak to it. The rest are generally situational to higher or lower enemies. For many players who tend to save their special weapons only for bosses, this isn’t much of a problem, but it leaves the game feeling less special in comparison to its predecessors if the default gun is the best choice for the majority of the playthrough. 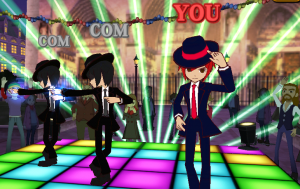 Unless you unlock gamebreaker Beat, whose fast, baddie-seeking pecks of death trump almost everything in your arsenal. This mechanical bird of prey homes in on any threat that Mega Man might have trouble reaching, which equals anything not right in front of it. And since bosses aren’t immune, Beat can swoop in and peck the baddie until its health is delepted or its energy runs out. 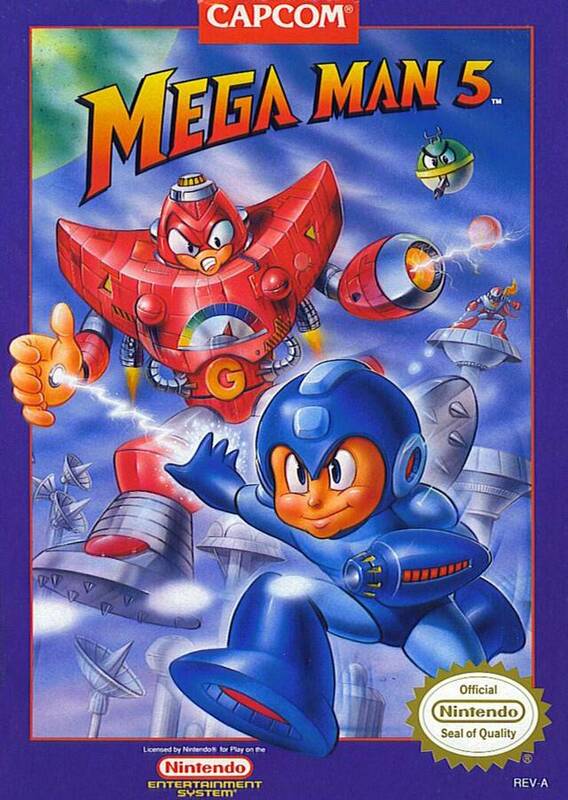 A small addition to Mega Man 5 that became a staple later on was the Mega Tank. Within a handful of stages, this E-Tank with an M on it not only refills Mega Man’s life points, but all of the weapon energy as well. Mega Man can only carry one at a time, with a side-effect of making all other M-Tanks he runs into disappear when he already got one. 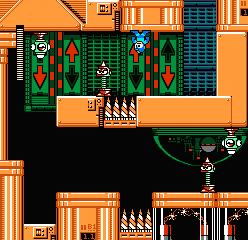 The late Wily stages have M-Tanks at or near the beginning of each level, negating the issue that weapons don’t refuel mid-fortress with a quick pick-me-up before replacing the spent tank with ease. Naturally, this exploit happens to occur in the game with one of the weakest weapon sets, but them’s the breaks. 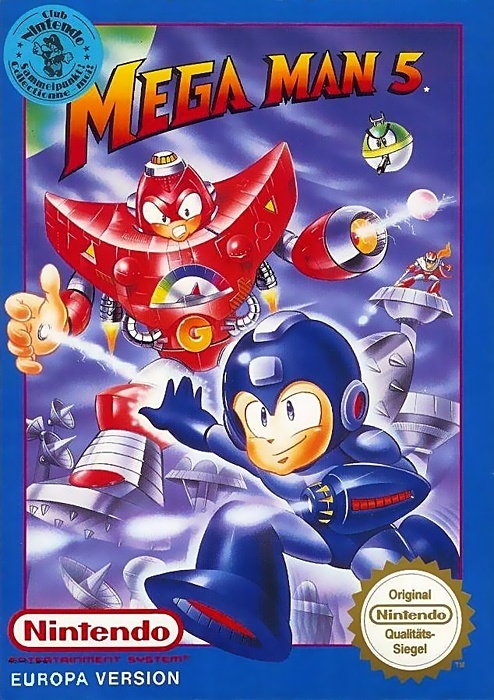 Later Mega Man games would change the item’s name to the Super Tank and would mostly be available only within the game’s store for a high price, without having Wily keeping a half a dozen just floating around to make things easy for his blue menance. There are a few other flaws brought about to the fifth installment, most likely at fault to the annual push. 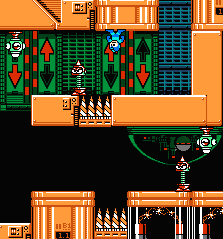 A few design quirks in the level structure lead to sloppy missteps with blank areas like placing a ladder on the far right side next to the next exit point, leading to a wasteful empty screen breaking up the flow. 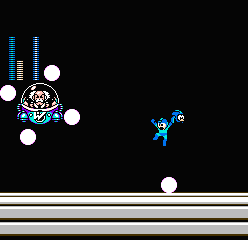 A few other areas force the Ble Bomber to back up in order to reset the scrolling, so he’s placed in the center. 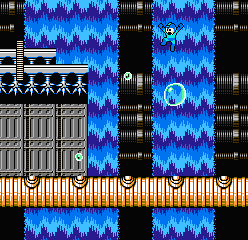 The retooled Rush Coil with the spring on the bottom of the robo-pooch is touchy at best, sometimes leaving Rush sproinging into the air without Mega Man in tow and wasting time and energy. 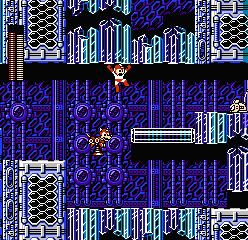 As always, the ending leaves Wily running off to scheme for another day, though it isn’t quite as ridiculous as his sudden door departure in Mega Man 4, since Mega Man and Proto Man are busy saving Dr. Light from the fortress collapsing in on all of them. Old vs new Rush Coil. 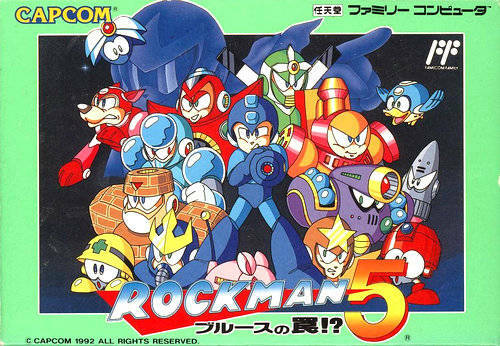 So why isn’t Mega Man 5 completely hated? 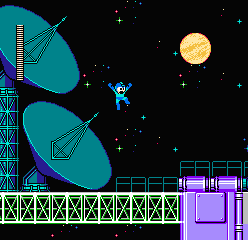 The game’s visuals and locales are arguably the most stunning of the series’ NES lineup. 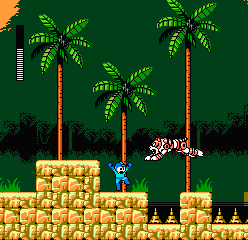 Given that the inner workings and technical tricks and memory mapping has been overhauled again and again over the years, Capcom’s crew was able to make the game vibrant with lesser repeating textures. The best examples might be the lush splendor of Napalm Man’s jungle slowly leading to the secret ammo stockpile bunker deep within the ground, the stark orange and blue gritting mountain summits and mining caves of Stone Man’s level, or the almost neon pink & purple Crystal Man’s domain. Many gimmicks and designs ideals have been tossed in for means of keeping the levels from seeming quite so stale. 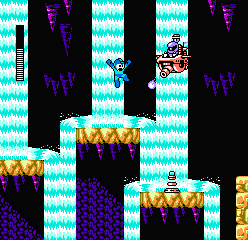 Wave Man has a jetski section with a massive robo-octopus battle, Star Man’s low gravity outer space physics, Charge Man’s train level bumping up and down on the tracks, and Gravity Man’s flipping gravitational switches that reverse the controller’s up and down inputs. 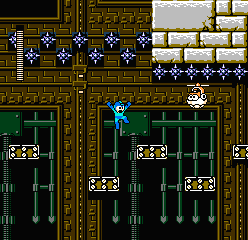 One late fortress stage even apes the snake block ride elements from Super Mario World. Mari Yamaguchi’s score stays strong and energetic throughout, though it tends to stay within the same “font”, as it were, while only changing the rhythm. Yoko Shimomura sneaks in by composing the music for the Dr. Wily stage music, which sadly only has one tune per fortress now. Mega Man 5 continues the love it-or-hate it trend of the latter NES episodes, not rocking the boat too bad but still lacking the cohesion that 2 or 3 had. Still, it showed that Capcom was willing to test out new gameplay twists, almost as if tossing ideas in to see what sticks. While much of it didn’t, what did make its way in the game worked before any gameplay spins and gimmicks went too far or broke the game entirely. Those would come later.